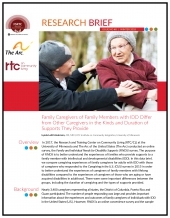 A brief comparing caregiving experiences of family caregivers for adults with intellectual and developmental disabilities (IDD) with those of caregivers who responded to the Caregiving in the U.S. (CUS) survey in 2015 in order to better understand the experiences of caregivers of family members with lifelong disabilities compared to the experiences of caregivers of those who are aging or have acquired disabilities in adulthood. The more recent survey was known as the Family and Individual Needs for Disability Supports (FINDS) survey and it was conducted online in 2017 by ICI's Research and Training Center on Community Living (RTC-CL) and The Arc of the United States (The Arc). The purpose of FINDS is to better understand the experiences of families who provide supports to a family member with IDD. There were some important differences between the groups, including the duration of caregiving and the types of supports provided.